Like all other Peregrine 3-4 plays to date, SS Zone Dog will attack the opposing offense, knocking players around and causing disruption, etc. However, its methods are a bit different than the likes of the plays to date which have emphasized press coverage, as only one of the two OLBs plays de facto bump coverage via a well positioned flats zone. No, this play brings aggression in the form of a flexible blitz package combined with better than expected pass coverage against even 3 or 4 wide receiver sets. The results of a confused quarterback, tipped passes, and forced turnovers are similar, but by varying techniques Peregrine 3-4 gains viability against a wider range of offensive plays. The big advantage gained with this play, as mentioned above, is the ability to defend against 3 or even 4 WR sets if necessary. This was previously a weakness of the formation, and opponents who were having trouble generating offense out of standard 2 WR sets could easily switch to a more wide open passing attack to force you away from Peregrine. While not exactly the ideal defense against something like Singleback-4 WR, SS Zone Dog can mostly hold its own, allowing you to continue to dictate the style of play to the offense. If the offense does decide to go aerial anyways, expect some big plays to be made on both sides of the ball. Your defense will generate pressure, sacks, and possibly turnovers, but your DBs in deep zone coverage will be isolated towards the deep corners with no man coverage help coming from underneath. Taking deep shots will still be a gamble for the offense, but they might make you pay if this defense is overused. Shifting the D-line left, right, or wide are all effective techniques, will keep the quarterback from getting too comfortable, and can help minimize the time your DBs will have to cover in isolation. Differences aside, this play does have a lot in common with the other Peregrine plays. It excels at stuffing runs to the outside, however it can get gashed just off tackle where there are no LBs to take direct shots at the ball carrier. A good pass catching TE will cause less problems than usual for the formation, but is still a concern. 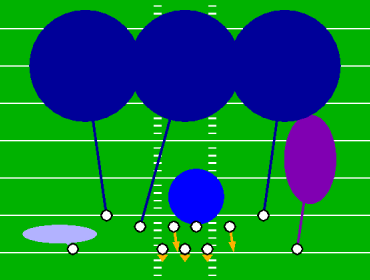 Press coverage is not emphasized as strongly, but offenses lining up in tight formations will still gain an advantage by not playing into the strengths of Peregrine on the outside. In spite of these somewhat persistent vulnerabilities, SS Zone Dog should be an excellent compliment to existing plays and continues to build Peregrine 3-4 into maybe my best defense yet.